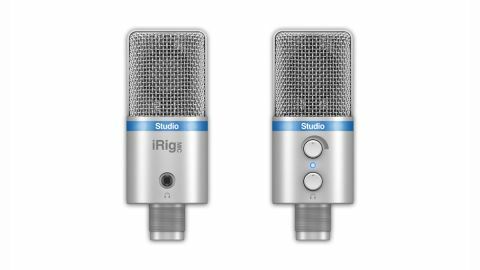 The iRig Studio Mic sounds really good and 'just works' with any and all music-making platforms. Great performance for the money. The new flagship at the front of IK's fleet of microphones is a small but reassuringly weighty large diaphragm condenser (1" back electret), available in moody black and natty silver models. Connection to the host computer, phone or tablet is made via a Micro-USB port in the base of the mic, which handles power and audio signals, and three cables are supplied, giving you options to connect to your device of choice via USB, Lightning or Micro-USB. Also in the box is a handy desktop tripod stand and a bag, while an included code unlocks a couple of mic models for IK's new Mic Room modelling app, and draws your attention to the usual suite of free apps for iOS and Android, which can be downloaded from their respective online stores. On the barrel of the iRig Mic Studio, a minijack headphone output enables monitoring through the built-in audio interface. A pair of knobs control the mic input gain and headphone output levels, and a multicoloured LED in between gives clear visual feedback on input signal level. The AD converter in the iRig Mic Studio operates at 24-bit and 44.1 or 48kHz, while the quoted frequency response of 20Hz-20kHz and maximum SPL of 133dB imply a high degree of versatility. In our testing, we found the mic to be a very capable performer for the money, capturing the finer details of a variety of vocal deliveries and acoustic guitar playing styles well, with accurate dynamic representation. We were also quite impressed by the relatively low noise floor of the built-in preamp. While the iRig Mic Studio isn't about to replace anyone's main 500-quid-plus studio microphone, we enthusiastically recommend it to singer/ songwriters, mobile producers and field recordists as an excellent low/mid-range option, primarily for its peerless portability and convenience, but also for its sensitivity and general performance.